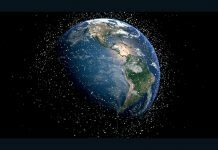 This is an article published in our March 2018 Issue. India’s armed forces, while undoubtedly professional, continue to be hampered by their traditional structure, unhelpful political process including an adherence to ‘Made in India’ that is not getting the international buy-in to really make it work. *: The authorised number of Indian Air Force (IAF) combat squadrons is 39.5 and it has submitted that this be increased to 42. As at December 2017, when 108 Squadron was disbanded (‘number-plated’), the squadron strength was 32. As new squadrons are formed (see below), it will be necessary to substantially increase the number of pilots, all of whom are commissioned officers. A major shortcoming in combat capabilities is lack of a joint headquarters having command responsibility for the three services. One barrier to the creation of a joint military commander is resistance on the part of the MoD’s civilian hierarchy to proposals it considers would diminish its powers. It is widely accepted that a chief of defence force with executive powers should be appointed in lieu of the Chairman of the Chiefs of Staff Committee who has no command responsibility, but although the Joint Doctrine Armed Forces (revised and updated in 2017), emphasises ‘joint planning and integration’ it makes no recommendation for creation of such a post. In October 2017 Defence Minister Nirmala Sitharaman said integration of the armed forces was “essential” but gave no indication that she might endorse appointment of a tri-service chief. 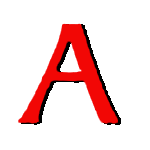 There are 17 Commands, directly answerable to their parent services: seven army (Northern, Eastern, Southern, Western, Central, South-western and Army Training Command), six air force (Western, Eastern, Southern, South-western, Central, and Training and Maintenance) and three navy (Western, Eastern, Southern). None of these has matching geographic areas of operational responsibility or inter-service means of direct coordination. 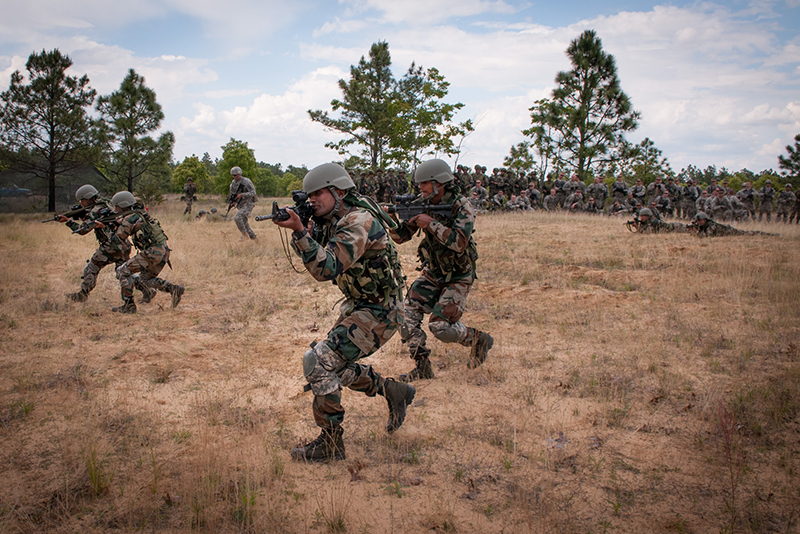 Indian Army soldiers with the 99th Mountain Brigade’s 2nd Battalion 5th Gurkha Rifles, train in the US during exercise Yudh Abhyas, an annual bilateral training event between the armies of the United States and India. Under current arrangements the HQ Integrated Defence Staff in Delhi acts as ‘the principal arm and Secretariat to the Chiefs of Staff Committee’ and has no executive role, as the only two joint commands, the Strategic Forces Command (SFC), and the Andaman and Nicobar Command (ANC) report directly to the Joint Chiefs of Staff Committee. The SFC is responsible for management and administration of nuclear weapons, but orders for their use are issued by the Nuclear Command Authority, headed by the prime minister who makes the release decision. Development of nuclear weapons continues, as does the ‘no first use’ policy endorsed by Prime Minister Modi, and it is estimated that the services have between 110 and 120 warheads in various configurations, aimed at achieving the ‘triad’ of land, air and underwater nuclear delivery systems which continue to be tested. It was, however, reported in the media that there had been failure of a test launch on 7 December 2017 of a K-4 missile from an underwater pontoon. In January 2018 there was a test firing of a nuclear-capable Agni-V three-stage solid fuelled missile, with a reported range of 5,500+km, and in February tests were conducted of an Agni-I (700km range), and a Prithvi-II (350km) liquid-fuelled missile. 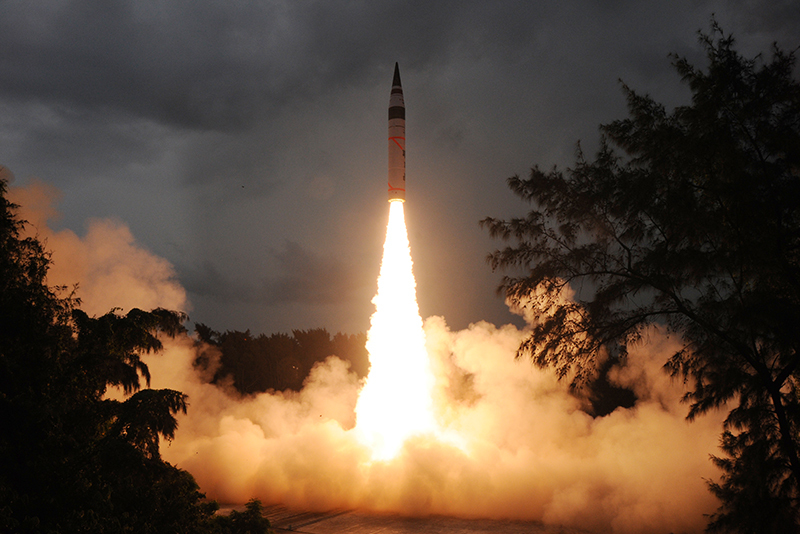 India continues to test-fire its nuclear capable Agni missiles, the most recent being at the start of the year. India’s disagreement with Pakistan involves the territory of Kashmir, divided between them on 1 January 1949, following post-Independence conflict in 1947-48. The ‘Line of Control’ (LoC) demarcating the areas controlled by the two countries was then established and remains in existence, being heavily garrisoned on both sides by large forces of army and paramilitary troops. In spite of a cease-fire agreed in 2003 there continue to be regular exchanges of small arms and artillery fire across the Line, and India accuses Pakistan of actively supporting anti-India terrorism and the widespread violence which verges on insurrection in Indian-administered Kashmir. 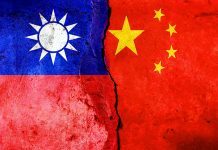 Incidents increased in early 2018, and the possibility of escalation is considerable. The ‘Line of Actual Control’ (LoAC) dividing territory disputed between India and China (no official boundary has been agreed) has three sectors: Western, in Ladakh and Indian-administered Kashmir); middle, in Uttarakhand and Himachal Pradesh; and eastern, in Sikkim and Arunachal Pradesh (referred to by China as ‘Southern Tibet’). The most recent dispute involved the building by China of a road in the Doklam plateau, claimed to be in Bhutan, where there was a non-violent but tense standoff from June to August 2017. 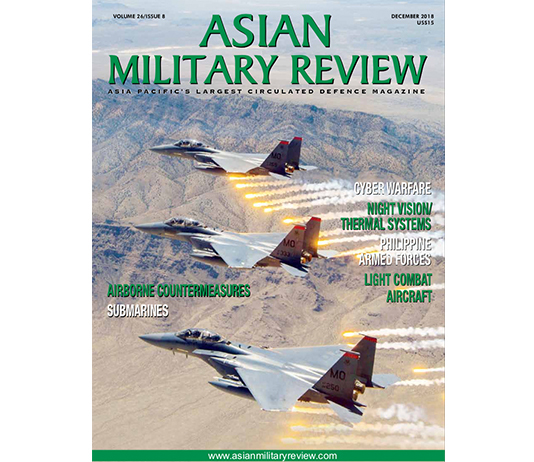 The effects of discord and frontier tension include India’s commitment of growing numbers of troops abutting contested areas, infrastructure development, and an ambitious equipment acquisition programme, all necessitating substantial defence expenditure which in the 2018 budget increased modestly to $46.16 billion from $43.59 billion in 2017. One major initiative associated with developments along the LoAC is the formation in East Bengal of 17 Mountain Strike Corps whose 59 Mountain Division, the first of two, was declared effective in May 2017. The raising of 72 Division is continuing and the army chief has stated that the Corps will be fully operational in 2021. The army’s deployment emphasis on the LoAC is complemented by road and bridge building in the region, and advanced landing grounds at Tuting, Mechuka, Along, Tawang, Pasighat and Walong have been rebuilt and improved, largely for the purpose of army resupply and reinforcement, but with some being able to accept combat aircraft. In August 2016 it was decided to form a fourth regiment of BrahMos cruise missiles (range, 290km, conventional warhead of 300kg) to be deployed to the far north-eastern state of Arunachal Pradesh, which China observed would have a ‘negative influence’ on frontier stability. The other services continue to develop the Brahmos, with the IAF having conducted a first test-firing in November 2017 from an Sukhoi Su-30, 42 of which are to be modified to operate the system. The Indian Navy (IN) , which already operates anti-ship Brahmos from major surface vessels, conducted a land-attack version launch test in April 2017. The army has a limited armed helicopter capability (one squadron of the indigenous Advanced Light Helicopter, the Hindustan Aeronautics Ltd (HAL) Dhruv, on the western border) and has long been contending that it, and not the air force, should be responsible for rotary close air support. A compromise was reached in 2014, with approval being given for acquisition of advanced armed helicopters, and in August 2017 it was announced that six Boeing AH-64E Apaches would be purchased for the army for $655 million. In 2015 the air force ordered 22 Apaches and 15 Boeing CH-47F Chinooks for $3 billion, with delivery beginning 2019. Negotiations have been completed for acquisition of 197 Russian Kamov KA-226T twin-engine utility helicopters in a joint venture, with Russian Helicopters holding 49.5 percent and Hindustan Aeronautics a 50.5 percent stake. Sixty are to be supplied in fly-away condition and the rest made in India. The army is to receive 133 and the IAF 64. 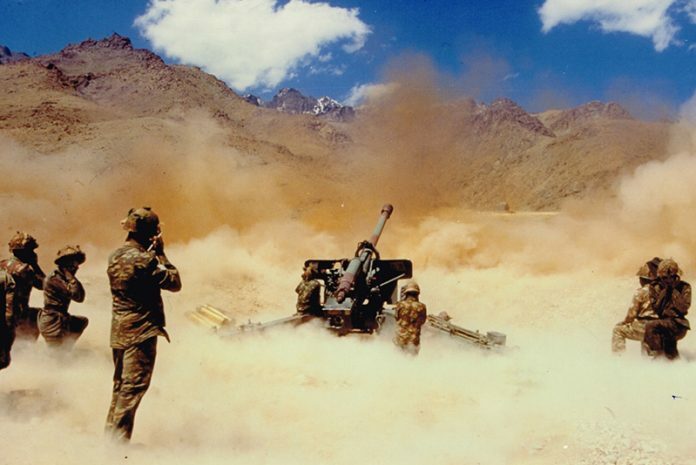 The Army has suffered from a lack of artillery since the late 1980s when a corruption scandal (still being investigated) affected further tendering processes. This badly delayed the 1999 artillery modernisation programme which was well-constructed and among other things emphasised the importance of calibre standardisation as far as practicable. 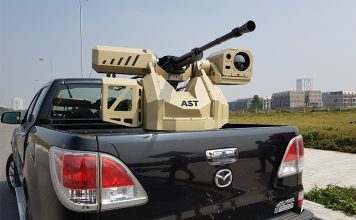 Under the plan, which began to be implemented in 2016, major acquisitions are to be 1,580 towed howitzers, 100 tracked self propelled (SP) guns, 180 wheeled SP guns and 814 truck-mounted systems. 400 equipments are being acquired off the shelf from foreign vendors, with the remainder being made or assembled in India, with maximum involvement of local industry. Systems include the India-developed Dhanush howitzer, developed from the Swedish Haubits 77A of which 410 were purchased from Bofors in the 1980s, and, thus far, 145 US M777s made by BAE’s Global Combat Systems ($750 million), and 100 South Korean (Hanwha Techwin) K-9 SP guns, to be made by Larsen and Toubro, Mumbai. In September 2017 media reported that the state-owned Ordnance Factory Board will probably receive an order in 2018 to licence-build 700 T-90S tanks, while the indigenous 120 km range Arjun Mk 1 tank (weight 58.5 tonnes; under development since 1974), of which there are 124 in service, is being developed in a Mk2 version, necessitating some 93 modifications, 13 of them major, required by the army. The IAF and IN acquisition programmes also involve the ‘Make in India’ policy. 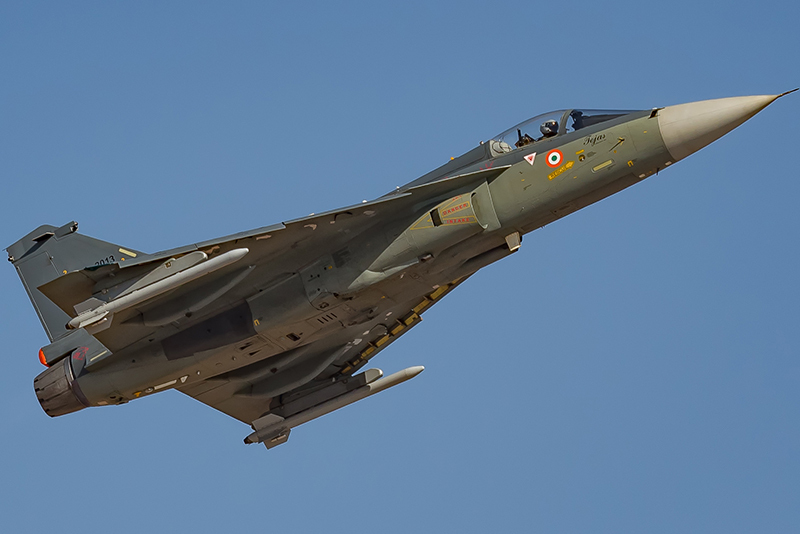 The air force is acquiring the indigenous Tejas, Light Combat Aircraft (LCA; under development since 1983) and at the moment operates five of an expected 123, with production by HAL running at some eight per year. There had been a long-negotiated but unsigned agreement for supply of 126 French Dassault Rafale aircraft but in 2015 this was reduced by the prime minister to 36 ($7.8 billion). The final contract, of September 2016, is for off-the shelf provision of 36 with options for a further 18. 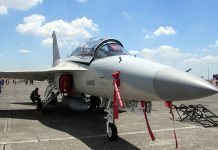 The Chief of the Air Staff, Air Chief Marshal BS Dhanoa, said in October 2017 that the IAF’s desired 42 fighter squadrons (currently 32) will be increased because “There is a plan by the government to induct fighters and by the end of 15th Plan, 2032, we will have the authorised strength. But with the numbers that we have got, we are capable of carrying out operations anytime.” In January 2018 government approval was given for acquisition of 240 Russian-manufactured 1100kg, laser-guided KAB-1500 munitions for the IAF’s Su-30MKI aircraft. The IN’s indigenously-built aircraft carrier Vikrant has a commissioning target date of 2020, and the Rafale is one possibility to meet the requirement for 57 carrier-borne multirole aircraft, the Tejas having been rejected on grounds of excess weight. A Request for Information (RfI) was issued in January 2017, and possibilities include the Boeing F-18 Super Hornet, Russia’s MIG-29K (49 in navy service), Lockheed Martin’s F-35, and the Gripen of Sweden which in February 2018 offered technology transfer in a proposed contract. The IN is also acquiring six licence-built French-origin Scorpene-class diesel-electric submarines of which the first, INS Kalvari, was launched in October 2015 and delivered in September 2017. According to the manufacturer, Mazagon Dock Shipbuilders Limited (MDL), it is expected to be commissioned “soon.” The second of class, Khanderi, was launched in January 2017 and is scheduled for commissioning in 2018, with the remaining four to enter service at one-year intervals thereafter. Four foreign submarine manufacturers – Naval Group of France, ThyssenKrupp Marine Systems of Germany, Sweden’s Saab Kockums and Russia’s Rubin Central Design Bureau for Marine Engineering – responded positively to the navy’s RfI of June 2017 for six attack submarines, which, with the Scorpenes, will replace the nine Sindhughosh and four Shishumar class boats. The navy operates one nuclear-powered attack submarine, the Chakra (Akula II) class, on hire from Russia, and has, thus far, one of a projected four ballistic missile submarines (SSBN), INS Arihant, reported to have been commissioned without ceremony (an unprecedented event) in late 2016. In January 2018 Indian media revealed that the Arihant had been docked for over nine months following a technical incident supposedly involving flooding of the engine compartment. In October 2017 the Defence Acquisition Council approved procurement (under an ‘acceptance of necessity’) of 111 armed utility helicopters. Although these are urgently required for anti-submarine duties it is expected that the tender and contract negotiation processes will be lengthy, given the terms that 16 be provided in fly-away, with 95 built in India by an Indian manufacturer with extensive technology transfer. Defence technology transfer is a major aspect of the ‘Make in India’ policy, introduced by the Bharatiya Janata Party’s prime minister, Narendra Modi, in 2014. It is an important initiative, and for domestic political reasons it is important, even essential, that it be seen to be successful. It is notable that India ranks 130 out of 189 on the World Bank’s Ease of Doing Business index and that in September 2017 international media reported that some $28 billion of defence tenders had been terminated since the Modi government took power in 2014. Senior sources indicated that responsibility lay with ‘delays in decision-making, a complex Defence Procurement Procedure (DPP), corruption, and insistence on furthering the government’s ‘Make in India’ initiative.’ Additionally, in December 2017 the parliamentary standing committee on defence criticised the government for denying adequate funds for defence modernisation and for failing to fast-track high priority defence procurement. In spite of the unsatisfactory state of affairs as regards procurement, and the continuing reluctance to modernise the highest defence command structure (which would conform with that of every other nation of consequence), the defence forces of India are professionally competent, commanded by high quality officers, and for the moment moderately well equipped. They would conduct themselves well in conflict.